A collectible calendar. 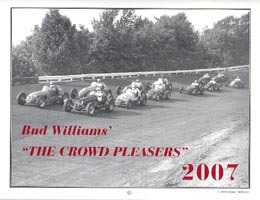 This makes the eighth year for this Bud Williams calendar series! The calendar is printed on glossy paper which brings the black & white photos to life. Only the best photos were used for this historical calendar. Featured drivers Johnny Thomson, Frank Lockhart, Ted Horn, Troy Ruttman, Bob Sweikert, Parnelli Jones, Sam Hanks, Tony Willman, Larry Crockett, Jim Rigsby, Pat O'Connor, and Tommy Hinnershitz. A special tribute to photgrapher Bob Sheldon.